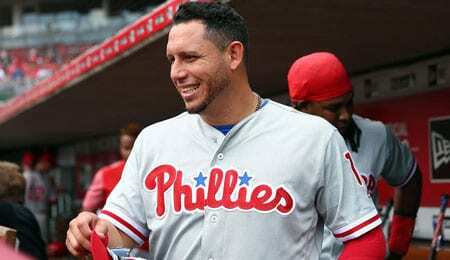 This year was definitely a tale of two cities for veteran Venezuelan infielder Asdrubal Cabrera. After being one of the few bright spots offensively for the Mets through July, he was moved at the deadline to Philadelphia. Even though they were going nowhere, that the Mets would help one of their fiercest rivals try to win the NL East was unthinkable. So unthinkable, in fact, that perhaps they sent them a Trojan horse, as Cabrera looked like a different player for the Phils, performing so poorly that he barely played down the stretch as they collapsed and fell out of the playoff race. After all, with Cabrera gone, who was left to clean up Yoenis Cespedes‘ broken bling (see video below)? In return for their treachery, the Mets received Double-A hurler Franklyn Kilome, another pitcher with potential for their cadre. But back to Cabrera, who this article is supposed to be about. All told, Cabrera was actually enjoying a career year with the Mets — at the age of 32. He was seeing plenty of action and — although his speed had now completely evaporated — he had a career high OPS at the time of the trade. For the Phils, however, his counting cat numbers tumbled as his power waned, and still — no speed. A negative WAR through 49 games in Philly tells you all you need to know. Although that Philly swoon took much of the shine off Cabrera’s season, he still managed a pretty productive campaign, reaching 75 RBI for just the second time in his career. But for the first time in a full season, he failed to swipe a single bag, disappointing for a dude that had reached double digits three times in his career. Still, 60 extra base knocks is nothing to sneeze at; in fact, it was a career high for Cabrera. For the past couple of years, he has no longer been just a shortstop in the field. Last year, he qualified at short, second and third base. This year, Cabrera morphed more into a second baseman, seeing most of his action there, but still played enough that he’ll again qualify at shortstop and third base in 2019. Defensively, even last year it was noticeable that his first step and speed are nowhere near what they were, not surprising given that he’ll be 33 next month. Cabrera’s throwing accuracy has degraded as well. All in, Cabrera was a more valuable offensive player this year, so we’re sure the Mets were pleased they exercised his option. Shortstop is a crowded market this winter, so while Cabrera is likely to get a job given his hitting resume, we highly doubt it’s in a shortstop-exclusive role. He’ll likely again be asked to fill a utility or timeshare role. At this stage, it’s wise to think of him as a second baseman. In looking at Cabrera’s place historically, it’s interesting to note the players that he shares the highest similarity scores with, as per baseball-reference. No. 1 on the list is Aaron Hill, followed by Rich Aurilia, J.J. Hardy, Alex Gonzalez, and finally, Shawon Dunston. That’s not a bad player to aspire to be. We’ll remind you that Dunston racked up 11.5 WAR in his career and wound up mashing 150 dingers. He also stuck around until 39. Does Cabrera have another seven years left in him to last that long? We’ll be curious where he winds up this winter, but chances are — given his positional flexibility and still potent bat — he’ll be a virtual must-own in standard size leagues. The fact that he hit much better on the road bodes well for another strong season, as long as he doesn’t somehow wind up back with the Mets. Now it’s your turn. In the comments below let us know where you think Cabrera will wind up and what kind of numbers we can expect from him in 2019. This entry was posted on Sunday, October 14th, 2018 at 12:22 pm	and is filed under BASEBALL, Free agents, Player profile, RotoRob. You can follow any responses to this entry through the RSS 2.0 feed. Both comments and pings are currently closed.